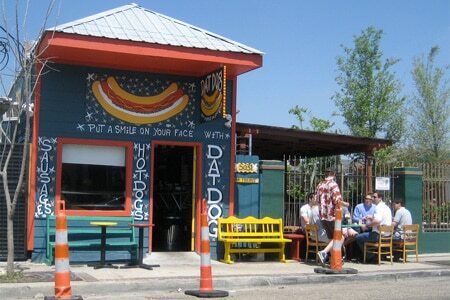 : Hot dogs are in a state of renaissance in New Orleans, largely led by Dat Dog. Choose from plain steamed German wieners and a variety of sausages (alligator, kielbasa, bratwurst, Louisiana hot and even crawfish). All are served on slightly sweet sourdough buns that are steamed and then toasted. Here's the best surprise of all: Dat Dog mixes the best milk shake around. The full bar offers an especially nice beer selection. Cramped and whimsically painted, Dat Dog is the brainchild of former federal prosecutor Constantine Georges and self-appointed "hot dog guy" Skip Murray, who began his hot dog career in London. Sometimes the simplest concepts are the ones that work the best --- Dat Dog is exhibit A. Other locations.